Sweater knitting season will soon be upon us, my dear knitter friends, and if you’re like me you’re already knitting twelve new fall sweaters in your mind. Well, I am also currently knitting 1 sweater in actual reality, but the twelve in my mind are really super too and if I could cast on all of them all at once, I would. I just finished and sent off one design sample and even though I still have things on the needles, it’s like it’s freed up one “sweater space” in my knitting life so I’m thinking about the next sweater(s) again. If you’re a practiced sweater knitter, you have already spent a lot of time thinking about getting gauge. There are times when gauge doesn’t matter as desperately, such as when making scarves (length and width are usually easy to modify longer or shorter as needed) or hats (they are small enough and quick enough that it is often easier to simply knit a new one if the first one comes out too small or big). Sweater knitting is not usually one of those times. Whether you are knitting a pattern from the top down or from the bottom up, you need to have clear knowledge of what gauge you are knitting to if the pattern is going to turn out how you want it. The ideal first step with large projects like sweaters – or any project where you want to be as sure as you can about how it will fit, is to knit a swatch. The larger the swatch, the better, in my opinion, because the larger the swatch is the closer it will come to mimicking how the yarn will behave when it is in full sweater size. (The only “true swatch” is a finished garment, as experienced knitters and teachers will tell you.) 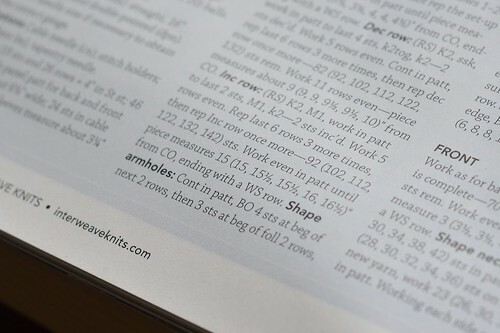 Find out your stitch gauge in stockinette and “in pattern” if the instructions call for it. 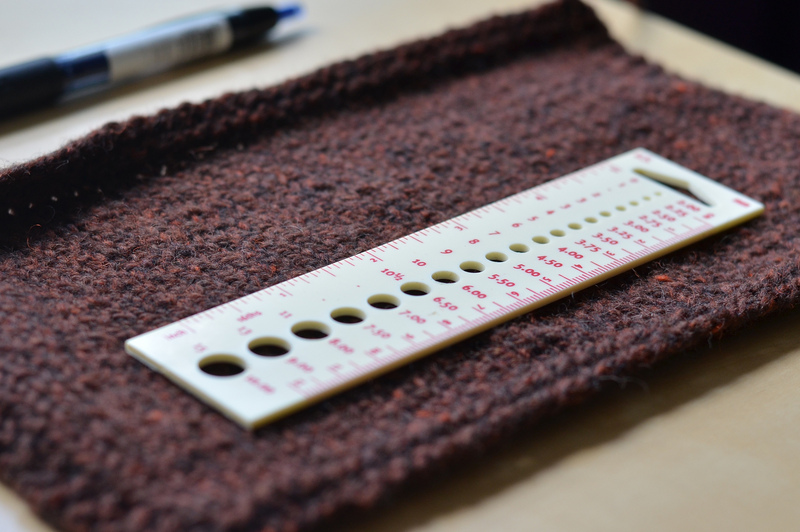 Do knit the swatch and wash it and lay it out to dry fully, before measuring gauge. (You’re planning to wash your finished sweater, right? If so, wash your swatch too.) If you are getting gauge – if your gauge in your swatch is the same as the gauge indicated in the pattern – then you can happily proceed. If you are not getting gauge, then you have some decisions to make. First, ask yourself how close your gauge is to the gauge in the pattern. If it calls for 22 sts/4 inches and you are getting 21 sts/4 inches, that means you are slightly too loose. The easiest next step is to go down a needle size and swatch again, and see if you get pattern gauge that way. If it calls for 22 sts/4 inches and you are getting 23 sts/4 inches, then your gauge is slightly too tight, and you should go up a needle size and swatch again. If you’re new to the swatching process, this is probably going to feel a little intimidating or even annoying. I don’t think swatching has become more fun, for me personally, but I do feel better about it since I know that it’s a useful process. If you end up swatching four times this will take you more time than not swatching at all, but it will still take you much less time than to knit a full sweater that doesn’t turn out the size you intended. If you do like the knitted fabric you are getting, but it’s not at the right gauge for the pattern and you still want to knit that pattern, you still have some options. Many knitters will choose at this point to knit that pattern at a different gauge by following the instructions for a different size. This is easier to do the simpler the pattern is. It is a riskier move, for example, with sweater patterns that have complex construction or multiple stitch patterns. If it’s a simpler pattern, though, this is more feasible. The solution involves a little extra pre-work and a calculator (remember – if you have a smartphone, you have a calculator). Essentially, you need to do some arithmetic and pattern reading to figure this out. Let us say that we are working with a mostly-stockinette pattern that has a stitch gauge of 5 stitches per inch, and the bust sizes offered in the pattern are: 34(37, 40, 43, 46, 49, 52, 55, 58) ins around. Let’s also say that we want to knit the 43-inch bust size (the 4th size here), because we’ve done our own measurements and considered how much ease we want to wear the sweater with, and the 43-inch bust is the best option. These sizes would correspond roughly to a stitch count at the bust of 170(185, 200, 215, 230, 245, 260, 275, 290) sts. So, the 4th size knitted at gauge will have about 215 sts at the bust. Look at the numbers indicated in your pattern to find this out for your size: if it’s a seamless sweater look for the stitch count indicated at the bust; If it’s a sweater worked in pieces, add together the bust stitch counts for front + back. Find the bust stitch count for your intended size. So, in this hypothetical example we’re knitting a sweater with a 43-inch bust at a stockinette gauge of 5 sts/inch, that will have a stitch count at the bust of 215 sts or close to it (43 x 5 = 215). Let us say, however, that we have swatched a boatload of swatches and the closest we can get while still liking the knitted fabric is 6 sts/inch, despite how many times we change needle sizes, and damnit we are going to knit this sweater at 6 sts/inch. Okay then! Let’s see what that means for this pattern by doing some quick math. If we want a 43 inch bust at 6 sts inch, 43 x 6 = 258. So, we would need about 258 sts at the bust. If we look up there at the hypothetical pattern sizes, we can see that there isn’t a size that uses 258 exactly, but there is a pattern size written for 260 sts – the 7th size. Pretty close! 2 extra stitches is not too much different, in fact you could decrease them away if you wanted to, at a good point in the pattern to do so. The original pattern, at stated gauge, gets 52 ins at the bust for that size, but at a different gauge it will turn out very close to 43 inches. You could knit those instructions to get the size results you want. Is this a perfect substitution? No. You will still need to pay attention to the difference of your row gauge in places (I have written about the significance of row gauge previously), and pay close attention to length measurements and other width measurements like the across-the-shoulder width, depth of shoulder or yoke, sleeve width, and so forth. The same mathematical exercise that we just did there should be applied to other parts of the pattern to help you get good results. This solution is not a one-size-fits-all solution. It’s not ideal for all patterns and does require you to have a comfort level with doing some calculations. However, if you like the yarn & gauge combo you’re getting, really want to apply it to that pattern you like, and are comfortable taking the time and attention to do it, it’s very possible in some situations. Judge your own situation accordingly and make your best choices! Also, keep in mind that it’s possible for many different knitters to get gauge using wildly different needle sizes, and that you might well get gauge using a very different needle size than what the designer of the pattern used. This is because all gauge is a result of knitter + yarn + needles, and all 3 of those variables may be different for you. Happy Thursday, knitter friends! May your next gauge swatch bring you good results and a lovely finished project. Very well written! Thank you so much for the information and the thorough explanation it is quite helpful. Thank you so much for this post! After I finish my first pair of socks, I want to try my hand at a sweater. I’ll definitely come back and refer to your post. You are a treasure, thank you for this. I taught myself to knit by watching YouTube videos, but they didn’t really help with gauge, something I still struggle with to this day. Great, great post! Thank you so much! I have never had someone explain it so clearly! I’ve wanted to make a sweater for a long time, but I was terrified of dealing with gauge. This makes sense to me and gives me the confidence to try. I appreciate your help. I love swatching! It’s such a relaxing stage before you get into the pattern itself! I already know my hands, so when the pattern is asking for 5 mm needle I usually go down to 3.5 and get the perfect gauge! So, just experimenting with needle sizes can really help and then you will already have an idea what you will get with your hands at the end! I am lucky that I usually get gauge with the recommended needles but I swatch anyway because you might not like the fabric and I am almost always substituting yarns for those given in the pattern. Buy extra yarn for swatching. Sometimes the pattern calls for more yarn than strictly necessary to make the design so you’re covered for swatching; other times it doesn’t. If you’re someone who usually needs to make multiple swatches to get to the correct gauge, you might need the padding of extra yarn. Running short of yarn because I needed so much for multiple swatches has happened to me. Besides extra yarn means you can do a great big swatches (and get a truer example of gauge) without worrying about the amount of yarn the swatch is eating up. Some great advice here! Thanks! This was a great, informative article. I have had those times when no matter what needle size I try I can’t get the gauge. This really gave some good info. Thanks so much! Thank you Glenna! This article on gauge is well written. I may print this out and stick it in my knitting notebook. Yes I still keep a paper pencil notebook even with Ravelry and a smart phone. format. Very nice layout ( I’m mobile and it looks fabulous!). Very interesting. I never thought about knitting a different size to accommodate a different gauge. Thank you! What if your gauge swatch changes significantly during washing? Do you record the initial measurements somewhere? If you’re watching length and row gauge while knitting a garment then you’d need to know the difference between the pre- and post-washed fabrics…right? Seems really complicated!